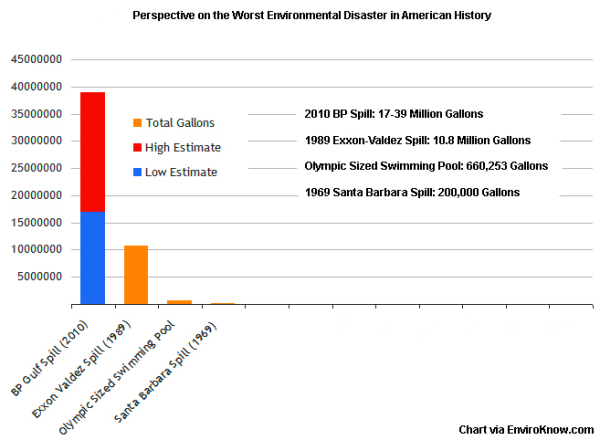 Now that we know that the BP’s gushing well has likely dumped somewhere between 18.6 million and and 39 million gallons of oil into the Gulf of Mexico, the disaster certifiably tops the list as the worst in US history, eclipsing the Exxon Valdez. It may even make it to the ranks of the worst oil spills in human history. Exxon Valdez didn’t even make that list; as bad as that was, there have been 33 larger spills around the would. The idea that this Gulf spill might not even qualify for that list is perhaps the most scary prospect.